Wedding dress has been professionally dry cleaned and looks brand new. Purchased from the Bridal Atelier, Double Bay Sydney in 2018. Purchased size 10C/D, and usually wear size 8-10 AUS. I am 164cm tall, and had alterations to shorten the length. I have kept this lace if it needs to be added for someone taller. I also had a small button sewed at the back, which enabled me to hook the train onto it. Prior to my wedding I required a slight adjustment and had the back taken in. Would fit a size 8-10. When purchasing the dress I chose the option to have the lace sleeves, however they can easily be removed. The lace belt is also detachable. 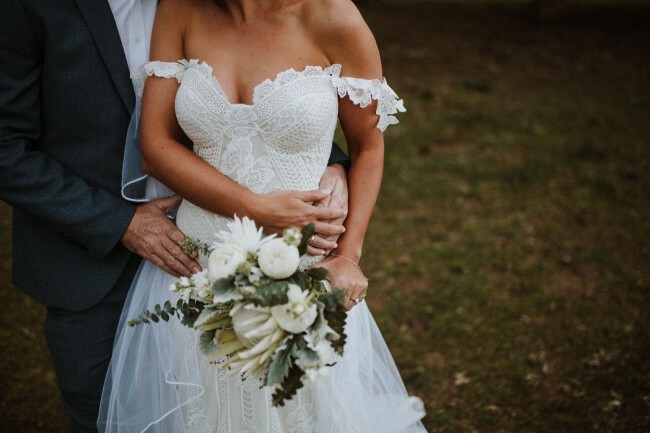 The dress is described on the Rue De Seine website as per below: Structured bustier gown with hip yoke, form fitting silhouette & floral appliqué detail from bust cups. Angular design lines throughout bodice with draped lace skirt and full train. Patchwork aesthetic & floral off the shoulder sleeves. Dress comes in original Bridal Atelier gown bag. Shortened length by removing a whole piece of lace. This piece can easily be re-attached if needed. Once you send a message, Rhea can invite you to purchase the dress.